The famous theatre director Peter Brook once wrote a book called the ‘Empty Space’ in which he explored how the theatre creates lasting memories for its audiences. I regard Private Drama’s ‘Empty Space’ as the venue in which we design, fashion and stage our events. They have their own unique personality and traits and become like a character in a play who influences the agenda and outcome of the evening. When planning an event either the venue is chosen first, which then determines everything that follows, or alternatively a theme or style of event is the driver in choosing a particular location. I find both processes equally exciting and inspiring. High ceilinged spaces with soaring columns such as the Natural History Museum or Royal Courts of Justice demand a grand and monumental response. Towards the end of the month, it will be our privilege to produce an evening that will not only be one of the last galas ever to take place in the Royal Courts of Justice but will include an elaborate, aerial, ‘Cirque de Soleil’ style performance. I can’t wait! 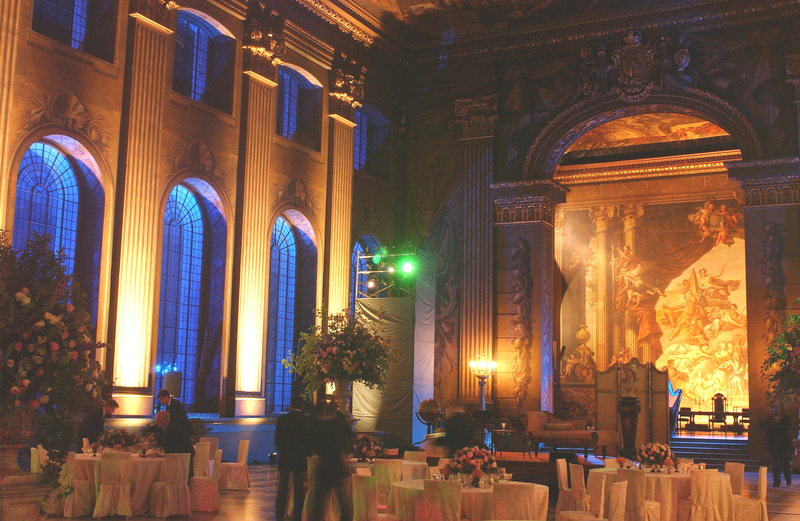 If the client is from overseas, historical venues such as Hampton Court Palace or Banqueting House lend themselves to scenes of feasting and court entertainment. We once designed an event in a Palazzo in Florence and took the renaissance style as our cue for all the design, catering and entertainment, allowing the building to impose its own personality and reawaken its past heritage for one special night. One of our biggest challenges in the last twelve months was to create a never to be repeated experience for guests in a Unesco World Heritage site in Potsdam in Germany. The mixture of Italian style architecture executed by German architects for King Frederick strongly influenced all our choices and it was thrilling to witness guests enjoying during dinner a private performance of Italian opera by the Berlin Philharmonic Orchestra staged against palace walls built in 1850. When no decision has been made on venue, it is fun to start to imagine the nature of the event i.e. a wedding, bar mitzvah, birthday party or chosen theme in a number of different locations. For a private party, a venue such as Two Temple Place lends itself to being used almost as a canvas for a three act play, the reception on the balcony, the dinner in the great hall and the lower gallery for late night dancing. Built in 1895 for William Waldorf Astor, the house was designed specifically for entertaining and it shows. We recently staged a 50thbirthday party at this address where for one night only it became the perfect location for a supper, cabaret club with exotic cocktails, delicious three course dinner and racy cabaret with midnight snacks. For another corporate client we needed a large blank canvas space to facilitate an evening in which we could host a large reception, serve a gourmet three course dinner and finally stage a full scale performance of Bizet’s ‘Carmen’ with orchestra, chorus and opera singers. We looked at countless different locations that either had the perfect acoustic, ideal address, facilities, or space before finally settling on the idea of using a disused car park in Oxford Street with no heating, running water or toilets! My client thought I had gone mad when I showed them round, but once we had created an artist’s impression of the different aspects of the party, as well as demonstrating that we had the track record and credibility for creating unforgettable events in challenging locations, did they finally agree that it was indeed the perfect space. This became a thrilling night where within 36 hours in freezing November temperatures the entire space was transformed from a site of dereliction and decay to a hot and balmy evening in Seville with orange trees burgeoning with fruit, climbing rose plants cascading with perfumed blooms and a banquet fit for a Spanish noble. To see the Royal Opera House production appear in front of an audience of two hundred VIPs on our purpose built stage in a complete re-staging of Bizet’s tale of gypsy love was incredibly exciting. I look forward to receiving the next challenge to stage an event where we are asked to re-imagine an established venue in a new and unexpected way or to find a hidden gem waiting to be discovered in a secret location.